Today in Google Street View crime: Cops say this brazen drug ring dealt heroin openly on the streets of Williamsburg. Police busted it after their surveillance cameras caught members stuffing heroin packages into a lock-box hidden behind a store's sign. 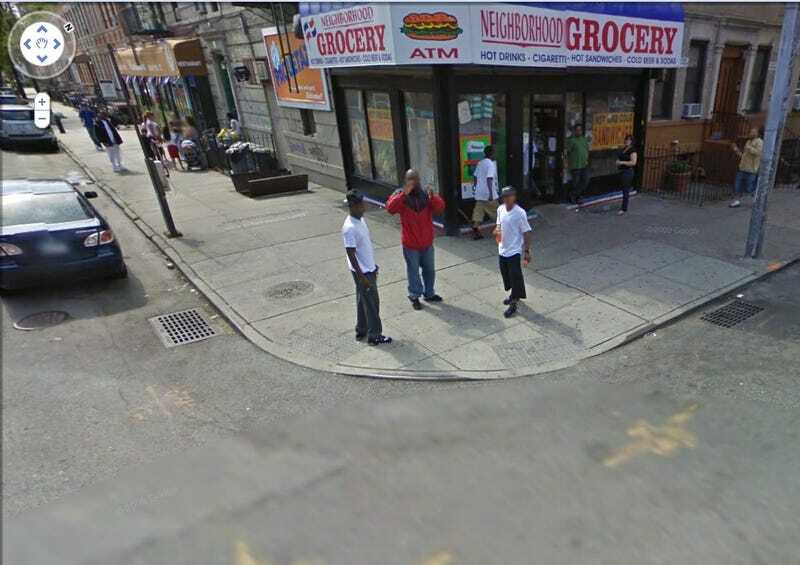 When the Google Street View car cruised by, these guys were hanging outside one of two bodegas in North Williamsburg, at the corner of Kingsland and Jackson, where they peddled their drugs. The guy in the red coat is 32 year-old Shaundell Dade, to the right is Jamel Pringle, 22, and to his left is Jonathan Paulino, 20, according to police. So, Google Street View car picked up a trailer-theft-in-progress in England, and a heroin ring in Brooklyn. Does the Street View Car catch criminals at every turn by coincidence, or does it actually inspire criminal behavior via some secret laser beam being developed at Google's Mountain View headquarters? Did Google Street View Just Catch a Thief? Either way, cops should probably tail the Street View Car, arresting everyone in its path. How Did I Do This Year?